A family vacation to Florida over New Year’s can be a low-cost, beachside adventure with hiking, biking and plenty of attractions. The cities and quaint oceanside towns dotting Florida’s Gulf Coast are often overlooked for their warmer weather cousins surrounding Miami and the Keys. But there’s still plenty to do in the crisp winter air from South Walton to Panama City Beach to Clearwater Beach, before ringing in the New Year. Here are three spots to start your family vacation search for the best places to celebrate the arrival of the new year. Find discount Florida hotel deals here. The Beaches of South Walton along 20 miles of Florida’s Panhandle are a mystery to anyone who has not driven Scenic 30A, the meandering route along the Gulf of Mexico. Squeaky white quartz sand beach reflects the sky to create the brightest turquoise water north of the Caribbean. Grayton Beach is one of 16 distinct communities with its own style of beach cottage, microbrewery and barefoot cafes. The protected Grayton Beach State Park surrounds Western Lake, a very rare, freshwater dune lake that draws wildlife into a salt marsh as it feeds into the Gulf. Swim or paddle board on one side of the road, then cross the dunes to bird watch, sketch the gnarled pines, or kayak on the shores of the dune lake. There’s good hiking and biking for all ages in this flat region, and trails have a variety of surfaces. Scenic Highway 30A is a good starting point for your excursion, because it provides access to other bike routes in Topsail Hill Preserve State Park, Grayton Beach State Park, and Point Washington State Forest. Your mountain bikers will find plenty of unpaved trails, but an easy one that’s paved follows Scenic Highway 30A for 18.6 miles. It covers a lot of territory through minimalls, neighborhoods and pristine state park lands. Rentals are easily found. New Year’s Eve in any of South Walton’s 16 beach communities is as low key as the rest of the year. 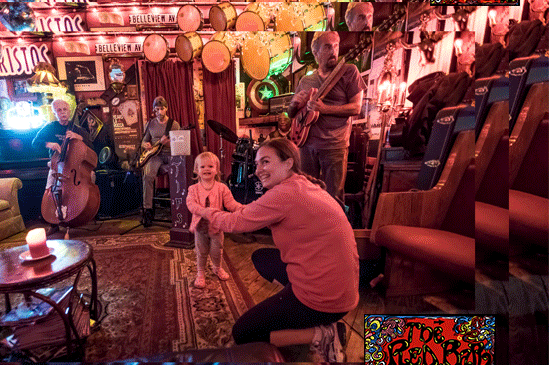 The very popular Red Bar will feature its house band, The Red Bar Jazz Band, and it will get so crowded you’ll want to go in for an early dinner — the food’s casual and very tasty. Other local clubs like Rum Runner’s Dueling Piano Bar (yes, two pianos that are fun to watch) and John Wehner’s Village Door, both in the Baytowne Wharf shopping and entertainment complex in Sandestin, will be business as usual. Village Door is the only local late night scene, with a live band and DJ’s turning up the dance tunes. Entertainment at the Village of Baytowne Wharf kicks off at 7 p.m. for fun, food and fireworks. Families with older kids looking to stay out late can stay until the live entertainment closes down the wharf at 1 a.m.
Family comes first in Clearwater Beach, located near St. Petersburg on Florida’s northwest coast. On New Year’s Eve, don’t expect too much bubbly to flow on those gorgeous, sugar sand, alcohol-free beaches. Instead, visitors and residents alike head to Pier 60, the midpoint in their six-mile beach, to enjoy what happens every day. The nightly Sunsets at Pier 60 Festival is part natural phenomenon / part show, with a large glowing disk descending over the Gulf of Mexico reflected in pools of water on the beach. While spectators on the sand or pier pose for selfies, others shop for crafts or watch buskers performing for tips. Since 1995, the Sunsets at Pier 60 event has hosted 25 to 50 crafters selling juried work that must be handmade and local to this part of Florida to qualify. Buskers include magicians, musicians, fire throwers and bucket drummers — many of whom travel the world performing as they go, and love returning to Clearwater Beach. It’s all great fun — and free — and super kid-friendly since there’s a broad paved boardwalk and so much people-watching. Are you wondering what you’re going to do between the afternoon (the Sunset Festival goes on from 4 p.m. to 8 p.m. on winter nights) and midnight? Well, on Friday and Saturday evenings, the Sunset Cinema shows films out on the lawn adjacent to the pier beginning at 7 p.m. For a post-sunset drink, slip off your shoes at Tommy’s Tiki Bar at the Hilton Clearwater Beach Resort & Spa, a cute place whose popularity rests on alcohol service being grandfathered in before local laws changed. Next, it’s supper at Frenchy’s Original, the ca. 1981 outpost of the city’s most popular seafood bar. There are five Frenchy’s now, each with slightly different menus, and each serving terrific, moderately priced, super fresh beer-battered grouper, garlic fries sprinkled with crab meat, cracked conch and more. Frenchy’s Rockaway Grill is the “fanciest” of these if you want to start the party early. And, keep in mind, Clearwater Beach’s many restaurants will be doing a New Year’s special meal, too. Shephard’s, the Sand Pearl, Hyatt Regency Clearwater Beach, Sheraton Sand Key Resort and Jimmy’s Fish House and Iguana Bar at the Holiday Inn are among the restaurants having private events, so book early. 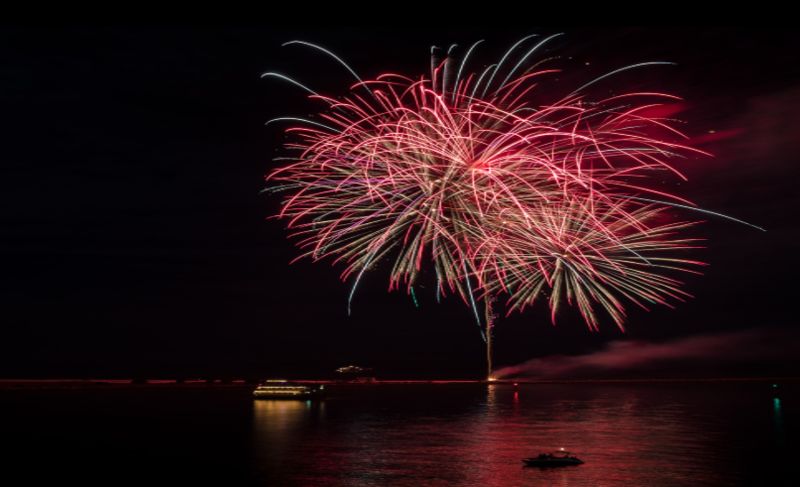 By 10:30 p.m. it’s time to find your place on the beach for Light It Up Clearwater, the annual New Year’s Eve fireworks spectacular. The way it’s reflected in the calm Gulf is a sight to see — well worth keeping the kids up for! Get a discount Florida rental car here. Art lovers can head to downtown St. Pete, where families are welcome to the 25th annual First Night in Downtown St. Pete New Year’s Eve celebration of the Arts. The family friendly event features plenty of games, art and dance starting at 4 p.m. If you’re up for the late-night crowd, stay for the fireworks and raise your glass in a toast at midnight. Over in nearby Tampa Bay, Busch Gardens is hosting its own New Year’s Eve celebration with thrill rides in the dark, including the newly debuted spin coaster Cobra’s Curse. Music, firewards in Gwazi Park and plenty of music and fun lights up the park until 1 a.m. Known for its sugary white sandy beaches and turquoise waters, Panama City Beach has rapidly grown from a quiet beachside military town to spring break partyland and finally a family-friendly destination. You probably already knew Panama City Beach could keep the kids entertained with activities from go-karting to boogie boarding. But there are also has plenty of indoor options for rain days like Ripley’s Believe Or Not, as well as holiday festivities. Panama City Beach has also been working hard to turn Thanksgiving, Christmas and New Year’s into family-friendly days with live entertainment, kid-friendly events, games and, during New Year’s; a beach ball drop at 8 p.m. That gives parents plenty of time to tuck their kids in bed before enjoying some time on a beachside patio or hiring a sitter to head out for their own fun. Panama City Beach is chilly in the winter. Even on a rainy New Year’s, however, the weather can still be warm enough to stroll the beach and take a dip. Area hotels usually have indoor pools and some feature game rooms and media centers to keep the kids busy during bad weather. This region of Florida is generally a bargain during the week of New Year’s. For example, Priceline shows hotels in the Panama City Beach area during New Year’s for as low as $44 for a Days Inn with “Pleasant” reviews, up to $76 for Comfort Inn Suites with “Excellent” reviews. Accommodations for multi-generational travelers and families looking to spread out also have lots of options through Florida including Wyndham vacation rentals, Towne Place Suites by Marriott, and Microtel Inn & Suites to name a few. You can also find discounts of up to 25% off your stay in December at beachfront locations. Looking for holiday light celebrations in Florida and beyond? 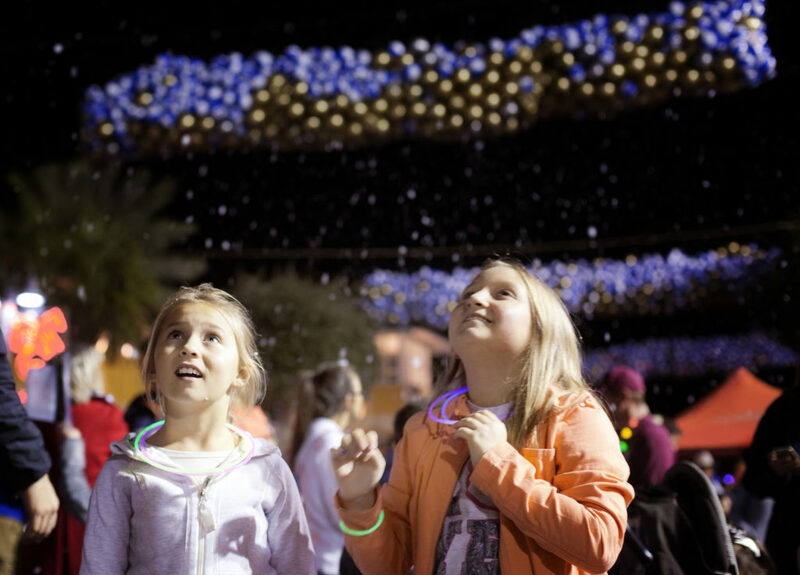 Wherever you decide to celebrate New Year’s Eve this year, make it a memorable event for the kids. You can ring in 2019 at 8 p.m. or midnight, and the kids will still forever remember it being a fun family vacation for the record books.